Kikkert, Peter. "Nunavut". The Canadian Encyclopedia, 22 January 2019, Historica Canada. https://www.thecanadianencyclopedia.ca/en/article/nunavut. Accessed 18 April 2019. Nunavut covers 1,936,113 km2 of land and 157,077 km2 of water in Northern Canada, representing 21 per cent of the country’s total area. The territory includes part of the mainland, most of the Arctic Archipelago, and all of the islands in Hudson Bay, James Bay and Ungava Bay. 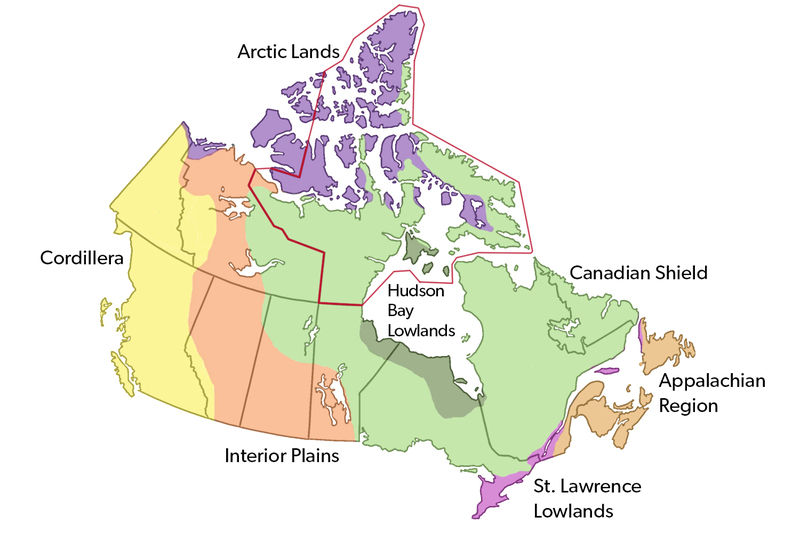 Contained within the territory of Nunavut are three distinct physiographic regions: the Hudson Bay Lowlands, the Canadian Shield and the Arctic Lands. Included within the Hudson Bay Lowlands, a sedimentary basin in the middle of the Canadian Shield, are Southampton Island and Coats Island in Hudson Bay. The Canadian Shield comprises much of the mainland, certain islands around Hudson Bay and parts of the Arctic Archipelago. The lowlands of the Canadian Shield, which rest on a bed of rock that is at least 1 billion years old and covered by a thin layer of soil, are often poorly drained and flat. A defining characteristic of this physiographic region are the thousands of lakes and rivers that dot the surface. Baffin Island represents the eastern rim of the Canadian Shield and is classified as a highland, possessing rolling plateau surfaces interrupted by glacial troughs. The Arctic Lands physiographic region extends throughout the northern half of Nunavut. The region contains the Arctic Coastal Plains, Arctic Lowlands and the Innuitian Region of the High Arctic. Made up of almost 100 major islands and over 36,000 smaller ones, the Arctic Archipelago represents that world’s largest High Arctic land area. Within its archipelagic territory, Nunavut contains five of the world’s 30 largest islands: Baffin (the largest island in Canada and fifth largest in the world), Ellesmere, Devon, Axel Heiberg and Prince of Wales. Victoria and Melville islands, also among the largest 30 islands in the world, are split between Nunavut and the Northwest Territories. The Archipelago is divided into northern and southern halves by the Parry Channel, which runs from Lancaster Sound on the eastern fringe to M’Clure Strait. The eastern edge of the Archipelago is a mountainous zone, with elevations approaching 2,000 m in the north, and a heavily fjorded coast. The ice caps that occupy the highest land on many of these islands contain the largest glaciers in Canada. In sharp contrast, the central and western islands are relatively flat, with low relief. On the northern islands, night lasts for 24 hours during the winter months, while day lasts for 24 hours during the summer. An example of the Canadian Shield in Naujaat (Repulse Bay), Nunavut, 12 August 2016. Nunavut is divided into three geological regions: the Innuitian Orogen in parts of the northern Archipelago, the Canadian Shield and the Interior Platform. The Innuitian Orogen, which lies primarily in the northern half of the archipelago, is made up of folded and gently dipping sedimentary rock. This area is composed of the Franklin Basin and the Sverdrup Basin, which have been accumulating sedimentary deposits for 500 million years. 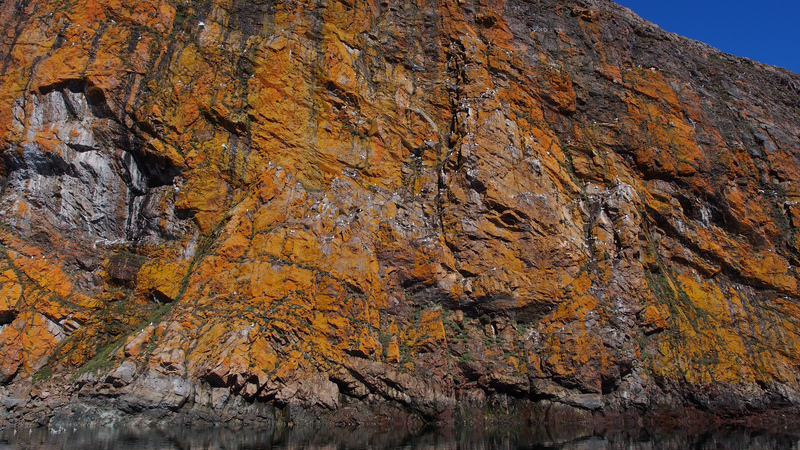 The Canadian Shield region contains some of the oldest igneous, metamorphic and sedimentary rocks on Earth — between one and four billion years old. The Interior Platform region, which encompasses most of the southern half of the Archipelago, is covered in rocks from the Cambrian to the Cenozoic era (i.e., as old as 542 million years). Mineral and hydrocarbon resources are abundant throughout Nunavut. The territory contains proven reserves of oil and gas, diamonds, gold, tin, uranium, iron ore, zinc, lead, rock salt, gypsum and other base metals. The Sverdrup Basin alone is thought to contain over 481 billion cubic metres of recoverable gas. The sparse, treeless tundra of Nunavut. Much of the land in Nunavut is characterized as tundra, which is bare, rocky and treeless. The soil of the tundra is locked in permafrost (perpetually frozen ground), which in Nunavut extends anywhere from a few metres to 1,500 m into the ground. Only a thin layer of the tundra thaws during the summer months. During this period, the ground is soggy and covered in marshes, lakes, bogs and streams. 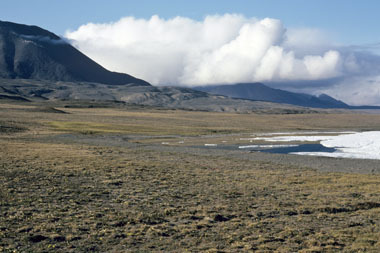 Moving northward in the Archipelago, the tundra progressively changes into polar desert as the climate becomes increasingly drier and colder. 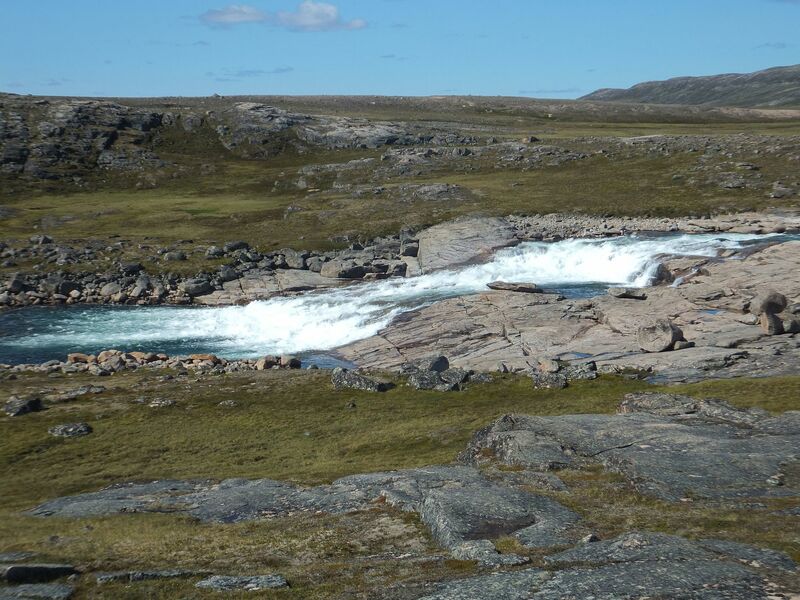 Nunavut contains 21 per cent of Canada’s freshwater within its rivers, streams and lakes. The Arctic Archipelago, with its land to water ratio of 1:1, is characterized by its many channels, ranging in depth from less than 100 m to more than 600 m in eastern Lancaster Sound. The dominant characteristic of the water in these channels is the seasonal to multiyear cover of sea ice, which can be several metres thick. This sea ice coverage is complete in winter throughout the Archipelago, although several recurring polynyas (areas of open water surrounded by sea ice) provide exceptions, the largest of which is in northern Baffin Bay. The climate varies across Nunavut’s vast territory. The entire region, however, experiences long, cold winters and cool summers. Nunavut is the coldest and driest part of Canada. Annual precipitation is very low. Large parts of the Archipelago, especially the northern half, receive only 100 to 200 mm of precipitation a year, which classifies it as polar desert. On Baffin Island, the average annual temperature may be as low as -20°C in the north and -6°C in the south. In Kugluktuk, the warmest community in Nunavut, the temperature can sometimes reach 30°C in the summer, with winter ranging from -15°C to -40°C. In contrast, temperatures in Grise Fiord, Nunavut’s coldest community, infrequently reach above 0 and frequently drop to −50°C in the winter. Spring temperatures are more consistent throughout the territory, with average daytime highs between -20°C and -10°C. The Arctic is experiencing climate warming faster and more intensely than most other parts of the world. Changes in Nunavut include higher temperatures, melting permafrost, reduced sea ice, thinning and retreating glaciers and diminished ice shelves. These changes threaten polar bears, seals, walruses, caribou and many other species on which traditional Inuit harvesting practices depend. Melting permafrost is also having a negative impact on housing and infrastructure throughout Nunavut. Grasses, mosses and lichens on the Nunavut landscape. 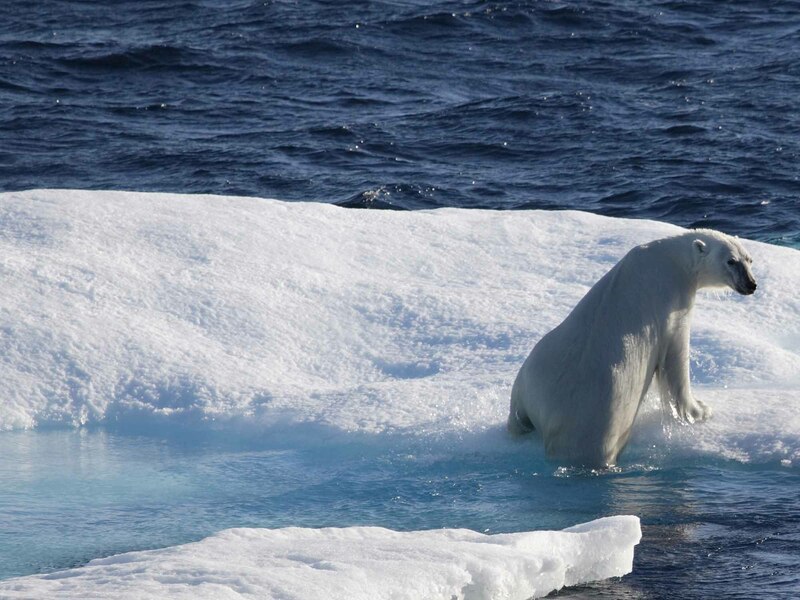 Polar bear on an ice floe in Nunavut. 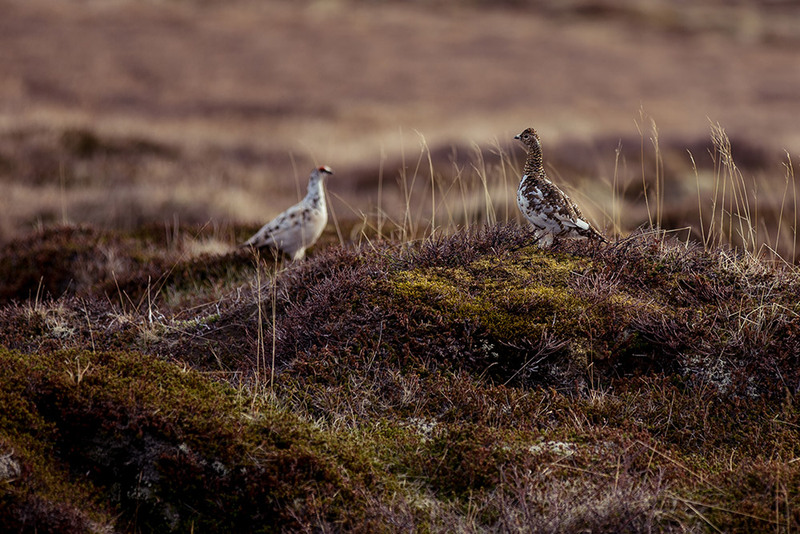 A male and female rock ptarmigan on the tundra. Photo taken on 18 May 2016. 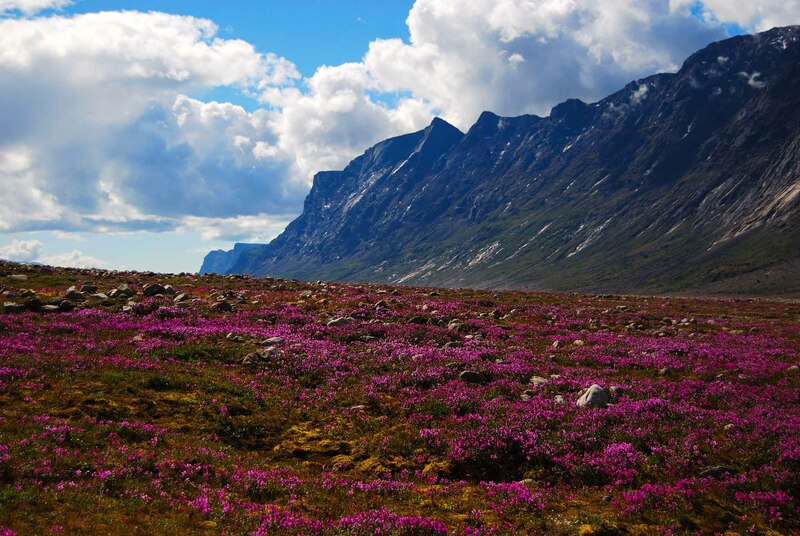 A wide array of flora and fauna can be found across the physiographic regions that make up Nunavut. 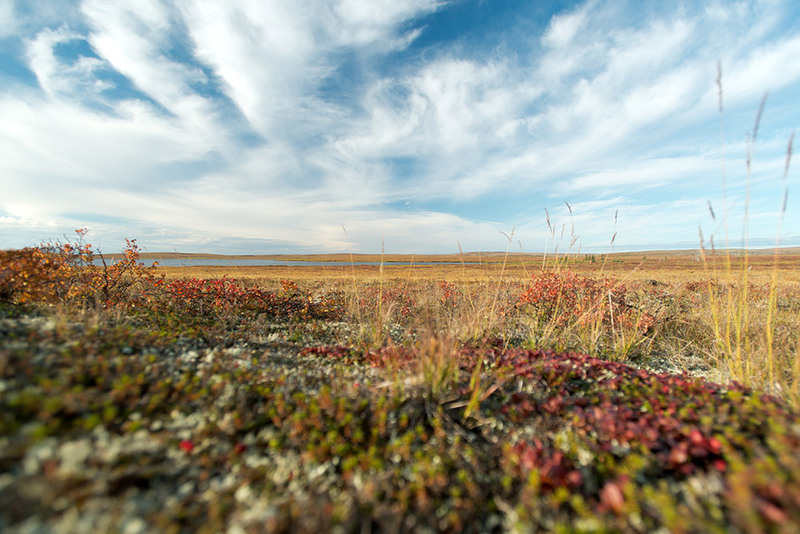 Although trees are absent, vegetation, including dwarf shrubs, grasses, mosses, lichens and about 200 species of flowering plants, manages to survive in Nunavut’s shallow soil. Nunavut is also home to dozens of land mammals, including polar bear, Peary caribou, barren-ground caribou, muskox, Arctic fox, Arctic wolf, Arctic hare, wolverine and lemming. The territory is also home to over 100 species of birds, most of which are migratory species, including auks, buntings, ducks, geese, cranes, loons, plovers, sandpipers and terns. Only the raven, snowy owl and ptarmigan spend the entire year in Nunavut. In addition, Nunavut’s waters are rich in mammals and fish. Aquatic mammals that live in the waters of the Archipelago include walrus, ringed seals, bearded seals, beluga, narwhal, bowhead and various other species of whale. Dwarf fireweed growing in a valley in Auyuittuq National Park, Nunavut. Photo taken on 13 July 2008. Lake Hazen area of Quttinirpaaq National Park, Nunavut. Sila River, Wager Bay, in Ukkusiksalik National Park, Nunavut. Photo taken on 23 July 2014. 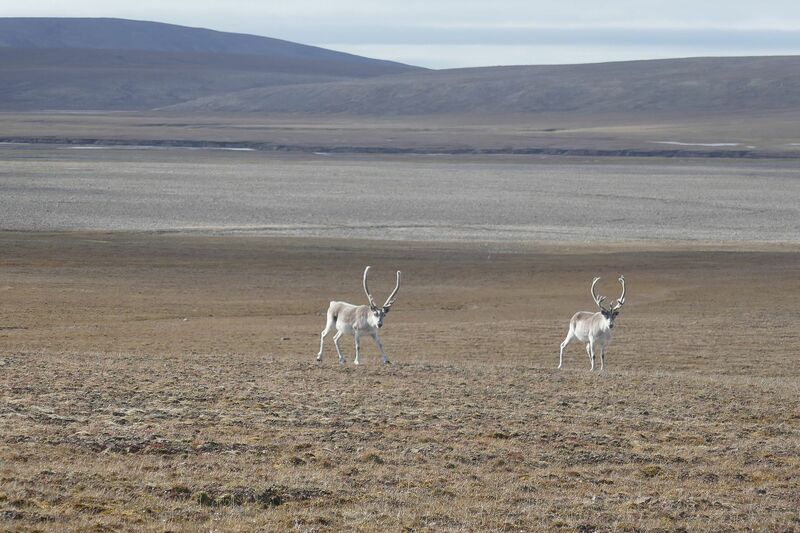 Peary caribou in Qausuittuq National Park, Nunavut, 30 July 2016. As of 2015, 12 per cent of the territory, including both land and water, are protected (236,621 km2). Nunavut has five national parks, covering 110,364 km2: Auyuittuq National Park, Quttinirpaaq National Park, Sirmilik National Park, Ukkusiksalik National Park and Qausuittuq National Park. The territory also has protected area sites, national wildlife areas, territorial parks, conservation and historic sites and wildlife sanctuaries. Currently, Lancaster Sound has been proposed as a National Marine Conservation Area. During the last Ice Age, much of Nunavut was covered by a thick sheet of glacial ice. Between 15,000 and 10,000 years ago the glaciers covering Nunavut melted, and shortly afterward the landscape filled with caribou and muskoxen, while walrus, seals and whales moved into the channels between the islands. While Indigenous peoples followed migrating caribou to the edge of the treeline on the mainland, they never ventured to the Arctic coastline or the islands beyond. Around 5,000 years ago, however, the first people began to explore the lands and sea that now make up Nunavut. In a wave of migration that likely started in Siberia, the Palaeoeskimos of the Pre-Dorset culture moved in small groups across the Arctic coastline and Archipelago, pushing through to Greenland and Labrador. As they encountered the different ecosystems and geography of the Arctic, they adapted their hunting techniques and tool technology. In Nunavut, they hunted muskoxen and caribou with bow and arrow, and seals, fish, walruses and even small whales by throwing harpoons from the shore or sea ice. For shelter, they crafted tents out of animal skin. The small cutting edges of their stone tools have led archaeologists to call the Pre-Dorset culture the Arctic Small Tool Tradition. The Pre-Dorset way of life transitioned to the Dorset culture 2,500 years ago, characterized by markedly different tool technology, including triangular blades and soapstone lamps. The Dorset hunted sea mammals, including narwhal and walrus. Unlike their predecessors, the Dorset lived in more permanent houses made of snow, stone and turf. About 1,000 years ago, another wave of migration started to move from the southern Bering Sea to the eastern Arctic. These people, known as the Thule, adapted a maritime hunting culture with the tools, boats and skills required to harvest the larger whales found in the waters of the Arctic Archipelago. Advanced tool technology that included the sealskin kayak, the open skin boat known as the umiaq, harpoons, fishing spears, lances, bows and arrows, a type of knife called the ulu, soapstone lamps and pots, and snow goggles, helped the Thule to successfully travel on the land and effectively harvest the animals that sustained them. In addition to whales, the Thule also harvested seal, fish, caribou and smaller mammals. The large volumes of food provided by the seal hunts allowed the Thule to live in larger, more permanent communities, often a dozen or more houses made of stone slabs, sod and whalebone. In these villages, people had ample leisure time to craft their sophisticated tools, often out of metal, and develop their vibrant culture, expressed in elaborate carvings, amongst other crafts. As the Thule pushed into the Arctic Archipelago, they moved into land inhabited by the Dorset. Inuit oral tradition remembers the Dorset as the Tuniit or the Sivullirmiut (the first inhabitants) and describes these people as peaceful giants, taller and stronger than the Thule. While there may have been some intermarriage or conflict between the two groups, on the whole a pattern of encounter and retreat seems to have been followed, with the Dorset choosing to keep their distance from the Thule and their culture. As the Dorset retreated into more marginal and inhospitable zones, the struggle to survive became ever more difficult. Although the idea is disputed between archaeologists, there is a chance that a small group of Dorset people known as the Sadlermiut survived in a small, isolated community on Coats, Walrus and Southampton islands in Hudson Bay (near the present-day Nunavut community of Coral Harbour) until they died of an epidemic in the early 20th century. Around 500 years ago, Thule culture changed dramatically. In response to a cooling climate, the Thule abandoned most of the northern Archipelago. In addition, their permanent villages started to break apart as the people embraced a more migratory life based on seasonal subsistence patterns shaped by local environments. The people now lived in small shifting family groups with a non-hierarchical social organization. The shift in Thule culture ended in the emergence of the diverse Inuit societies that exist in Nunavut today. Throughout the Kitikmeot, groups of Inuit — the Inuinnait and the Netsilingmiut — thrived in a pattern of life perfectly adapted to the environmental conditions of the central Arctic. In a seasonal cycle that repeated year after year, they lived in large iglu villages on the sea ice and hunted seals during the winter months before returning to the land in smaller groups to fish and hunt caribou in the spring and summer. These groups were amongst the most nomadic people in the North American Arctic, and they travelled extensively in their seasonal cycle as they sought the best hunting and fishing grounds in the region. In the coastal areas of the Kivalliq, the Kivallirmiut (also called Caribou Inuit) adapted to life in the interior, where they hunted caribou and geese and fished for trout. 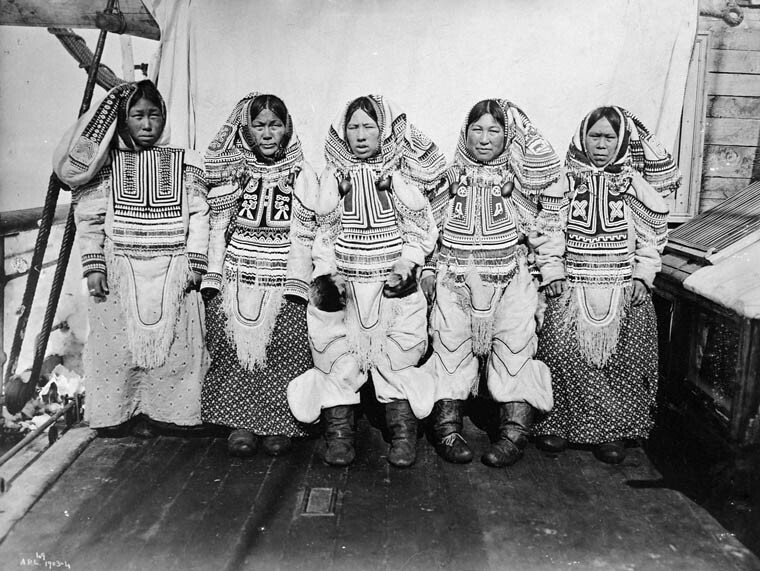 Their dependence on inland rather than coastal resources made them unique among Inuit societies. During the fall hunt, populations gathered at a few good hunting spots to replenish their food supplies for winter. Caribou skins were used to make clothes and containers, as well as tents during the summer months and snowhouses during the winter. In the Qikiqtaaluk, the different groups of Baffin Island Inuit and the Iglulingmuit adapted to their local environments. The people of the Qikiqtaaluk harvested walruses, seals, caribou and arctic char. The first Europeans to explore parts of Arctic North America were the Norse. After settling along the southwestern coast of Greenland after the year 980, groups of Norse intermittently ventured to the eastern fringe of the Arctic Archipelago until about 1450 CE in search of resources and trading partners. Most scholars agree that the Norse called Baffin Island “Helluland.” Archaeological remains indicate that as the Norse ventured into the region, they met and traded with first the Dorset and then the Thule inhabitants. In the first European forays into the Arctic Archipelago in the 16th and early 17th centuries, explorers searched for a commercial route to Asia, a water passageway known as the Northwest Passage linking the Atlantic and Pacific oceans above northern North America. During three expeditions in the late 1570s, Martin Frobisher explored Greenland (the Norse abandoned the area in the early 15th century), sailed into the bay on western Baffin Island that now bears his name and claimed the region for Queen Elizabeth I. By 1620, John Davis, Robert Bylot and William Baffin had followed Frobisher’s route and pushed further north into Davis Strait, Smith, Jones and Lancaster Sounds and charted the eastern coastline of Baffin Island. Soon after, English efforts relocated to the southerly reaches of the North American archipelago, where in 1610 Henry Hudson explored the enormous bay named after him. By the end of the century, the newly formed Hudson’s Bay Company dominated exploration in the North, but its focus on the subarctic fur trade left little incentive to support forays into the Arctic Archipelago. 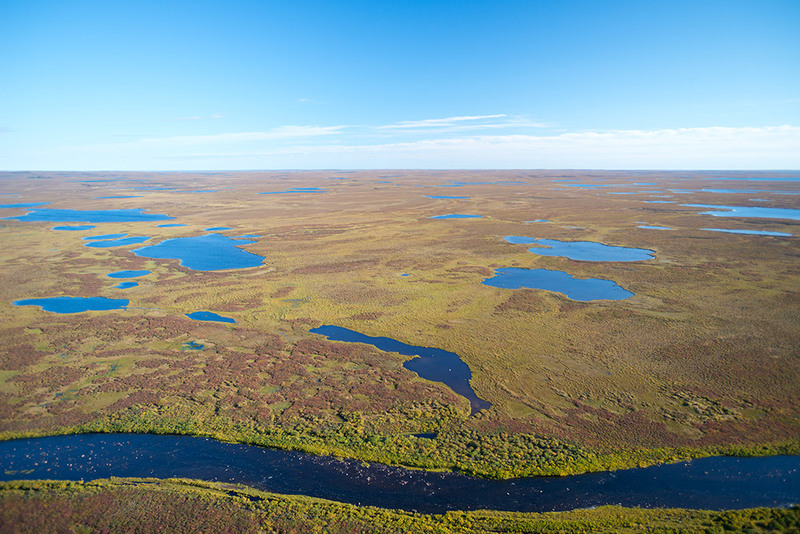 With a great deal of assistance from Indigenous peoples and their technologies, Samuel Hearne made it to the Arctic coast by way of the Coppermine River in 1771, stopping at what is now Kugluktuk. After French leader Napoleon’s final defeat at Waterloo in 1815, the British Royal Navy “ruled the waves.” Without a war to fight and Britain’s sea-lanes of trade and communication secure, the navy struggled to find an outlet for its energies. Government-sponsored polar exploration provided a purpose for the Royal Navy and a testing ground for its ships and men, while adding to British power and prestige. Between 1818 and 1845, the navy uncovered large parts of Arctic North America as it sent its ships and crews into the ice and labyrinth of islands in the Archipelago (see Arctic Exploration). The Franklin search internationalized exploration in the Arctic Archipelago. Englishman E.A. Inglefield and Americans E.K. Kane, I. Hayes and C.F. Hall navigated the channel between Greenland and Ellesmere Island, and the survey of Ellesmere’s east shore was completed by the 1875–76 British polar expedition under G.S. Nares. In 1876, P. Aldrich rounded the top of Ellesmere Island and named the northernmost point of what is now Canadian territory Cape Columbia. Norwegian Otto Sverdrup explored the western shore of Ellesmere Island (1898–1902). Sverdrup and his men also surveyed the entire coast of Axel Heiberg Island, and to the west discovered and mapped Amund Ringnes and Ellef Ringnes islands and King Christian Island. From 1903 to 1906, another Norwegian explorer, Roald Amundsen, made use of the internal combustion engine to propel his 47-ton Gjøa through the Northwest Passage for the first time. 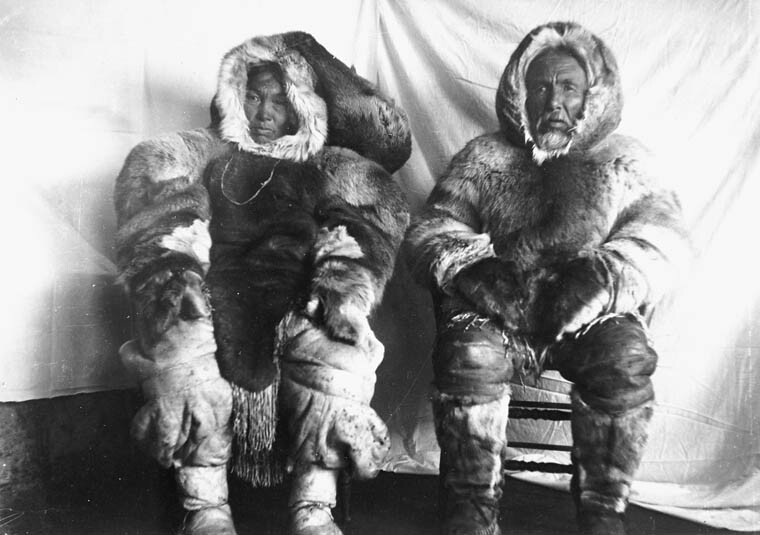 From left to right: Tulugaq and Tassiuq, photographed at Qatiktalik (Cape Fullerton), Nunavut, c. 1904-05. Between 1913 and 1918, the northern party of the Canadian Arctic Expedition (CAE), led by Vilhjalmur Stefansson, outlined the edge of Canada’s continental shelf and discovered some of the world’s last major land masses — Lougheed, Borden, Mackenzie King, Meighen and Brock islands — while drifting dangerously but deliberately on ice floes. Meanwhile, the southern party explored much of the Kitikmeot region, contacting groups of Inuinnait and extensively studying their culture and language. Over this time, many groups of Inuit encountered European explorers and started to trade furs and other traditional items for European food and metal tools. Inuit played important roles in many of these expeditions, as hunters, guides and interpreters, even assisting the Europeans with their mapmaking. Many explorers owed their success — and lives — to Inuit who taught them how to travel effectively, dress properly for the weather and live off the land. While the explorers initiated contact with many Inuit groups, the arrival of whalers, fur traders and missionaries had a far greater impact. In the late 18th century, European whaling operations began in the Eastern Arctic, and by 1840, American, English and Scottish whalers had established year-round shore stations in Cumberland Sound, where they occasionally hired Inuit families to work for them. This long-term European presence brought greater trade to the Inuit groups in the region, but also more diseases. Extensive whaling operations also led to overharvesting, which led whaling crews to expand their focus to caribou and muskox, depleting many of animals essential to Inuit subsistence patterns. By the end of the century, the whaling industry in the Eastern Arctic had come to an end. 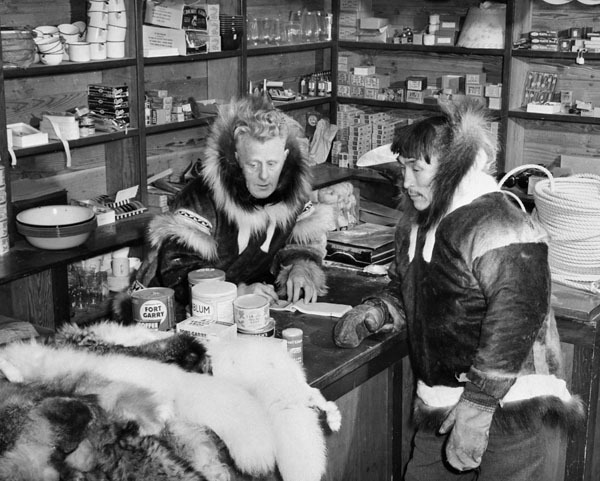 Leo Manning, manager of the Hudson's Bay Company trading post in Kugluktuk, Nunavut, lists the items being exchanged, 1949. By the late 19th century, fur traders started to move into the territory that now makes up Nunavut. In the early 20th century, fur-trading posts were established at the sites of many of the communities that now exist in Nunavut. The involvement of Inuit in the fur-trade economy changed their lives in subtle ways. With a steady source of cash income now available, Inuit could purchase a steady stream of hunting supplies, canned food and luxury goods from the fur traders. These trade goods, which included new technologies such as rifles, stoves and steel traps, changed how they hunted and lived on the land. To attend to their trap lines between April and November, many Inuit in the central Arctic settled into coastal trapping locations rather than in winter sealing camps on the sea ice, ending the seasonal cycle that their ancestors had embraced for centuries. Focus on the fur trade shifted Inuit from focus on hunting solely for food, clothing and shelter to supplying outsiders with goods. This altered traditional trade and migration patterns, and some Inuit chose to settle closer to the fur-trading posts. Clockwise from top: Reverend W. James, Winnie Attungala, David Annanaut, Ruth Tulurialit and Esa Tarraq (names of seated boys unknown). James, a missionary, is teaching his students how to read Inuktitut syllabics. Baker Lake, Nunavut, 1948. In the footsteps of the whalers and fur traders came the missionaries, both Catholic and Protestant, who established churches, provided health care and established mission schools — often in competition with one another. Many missionaries promoted practices and ideals that challenged the Inuit belief system and attempted to end certain traditional practices. In the eastern and western Arctic, missionaries translated the New Testament into Inuit dialects using a system of syllabic writing. While these developments changed the way that Inuit lived and sometimes brought additional hardships, none were as serious as the epidemics that the Europeans brought with them. Measles, tuberculosis	and influenza killed many Inuit. During much of the 19th century, the British government and its Colonial Office spent little time thinking about their claim to the islands. While explorers planted flags and made claims, Britain never formally annexed the Arctic Islands into its empire. In the 1870s, however, concerns arose about potential American claims to the islands of the Archipelago. In 1880, Britain transferred its rights to the islands to Canada. For its part, after 1880, Canada did little to consolidate its administrative or practical control over the Archipelago. By the turn of the century, the activities of foreign explorers in the High Arctic islands and ongoing concerns about the strength of its legal claims prompted the Canadian government to extend its efforts in Arctic North America. Joseph-Elzéar Bernier patrolled the waters of Hudson Bay	and the Arctic islands, asserting control and indicating Canada’s supervision over the region. Bernier intercepted and imposed licenses on foreign whalers, collected customs duties, conducted geographical research and planted the flag on many northern islands. In 1919 and 1920, concerns over the Danish government’s alleged denial of Canadian sovereignty over Ellesmere Island led to greater government activity on the eastern fringe of the archipelago.In 1922, the Liberal government of William Lyon Mackenzie King instituted an annual ship patrol in the Eastern Arctic and established new RCMP posts at Pond Inlet on Baffin Island and Craig Harbour on Ellesmere. When in 1925 an American expedition announced its plans to explore the area above Ellesmere Island and refused to ask the Canadian government’s permission, it led to more police posts and patrols around the islands of the Archipelago and Ottawa’s insistence that any explorer or scientist who wished to travel in the Archipelago must apply to Ottawa for a license. In 1930, negotiations with the Norwegian government led to its recognition of Canada’s sovereignty over the Sverdrup Islands. As the Canadian government extended its administration throughout Nunavut, it also tried to determine its relationship with Inuit. Although the collapse of the fur trade in the 1930s led the federal government to initiate relief programs for certain groups of Inuit, in order to save administrative costs, official policy continued to promote a traditional, self-sufficient way of life for Inuit into the 1950s. In 1939, the Supreme Court of Canada	ruled in the Re Eskimo case that, constitutionally, Inuit should be classified as Indians in Canada, which made them the legal responsibility of the federal government. Still, no comprehensive Inuit policy emerged. In 1951, the government amended the Indian Act to exclude Inuit. As these events went on in Ottawa, most Inuit continued their traditional life, although contact with people from the South slowly increased. 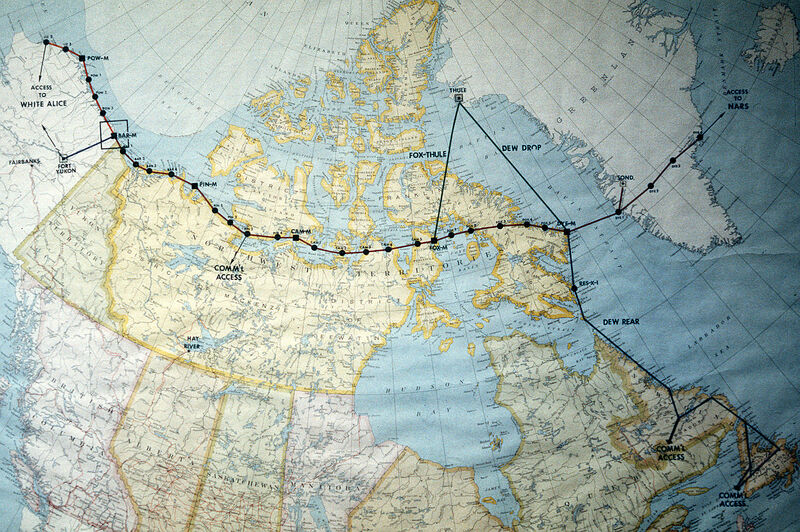 During the Second World War, the American military developed several ambitious defence projects for what is now Nunavut, including the Crimson Route, an alternate path for ferrying planes and material to Britain. Air bases were built, complete with support facilities and the required infrastructure. The Crimson Route involved installations at Churchill, Manitoba; Southampton Island in Hudson Bay; Fort Chimo (Kuujjuaq); Iqaluit	(then called Frobisher Bay by non-Inuit); Padloping Island in Davis Strait’s Merchants Bay; and other northern sites. The presence of large numbers of American military personnel at these installations had a large impact on Inuit living near them. 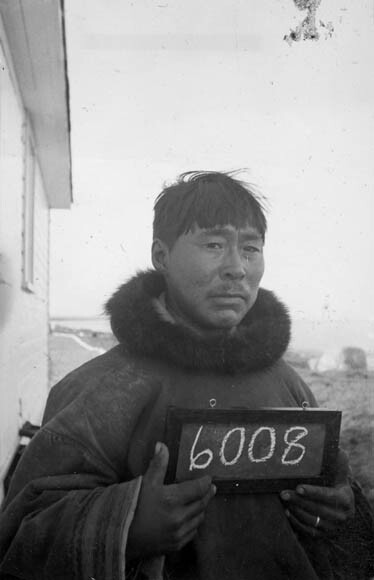 During the war the Canadian government also started to issue identification disks to Inuit in order to keep track of them — reducing them to a number for administrative ease (this practice was only discontinued in 1971, when all Inuit selected surnames). A map of North America's Distant Early Warning (DEW) Line, composed of 30 radar stations stretching from Greenland to Alaska. 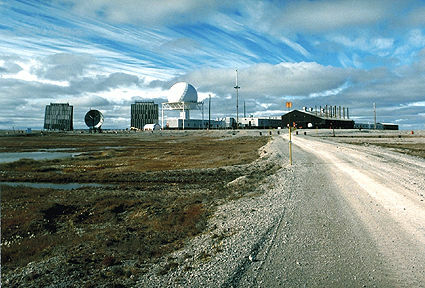 The former DEW radar station at Hall Beach, Nunavut. As relations between the Soviet Union and the United States deteriorated after the Second World War , it became obvious to defence planners that the Arctic would form the front line if another world war broke out. In the years that followed, air bases and military stations were built across Nunavut, culminating in the construction of the Distant Early Warning Line — a radar line that could provide advanced warning of incoming Soviet bombers — in 1955. The construction of the DEW Line stations brought hundreds of ships, planes and workers to the Canadian Arctic. They brought with them buildings, steel towers, oil drums, electronic equipment, paint, wood, wire and all types of construction gear. This, and the other defence activities that the Cold War inspired, forever changed the face of Nunavut and the lives of Inuit. Military construction became a key impetus for Inuit to settle in permanent communities. The military recruited Inuit to work on construction projects, which caused many to come off the land and settle around military installations. While many performed janitorial duties and manual labour, others received training as mechanics, carpenters, drivers and heavy equipment operators. Inuit workers continued to hunt and fish whenever they had a chance, but more families started to supplement country food with whatever rations they could secure from personnel working at the DEW Line stations. The wage economy began to undermine the traditional social organization of the Inuit, changed family life and parenting norms (as men left for weeks at a time) and altered gender roles. For many Inuit, the DEW Line brought a dramatic shift from a self-sustaining nomadic life to sedentary community life and a wage-based economy. New clothes, new housing and new technology all led to rapid lifestyle changes in a very short period of time. The construction phase of the DEW Line lasted only a couple of years. While some Inuit workers found full-time work at the stations, more were laid off. The fur trade still offered some cash income, and many Inuit continued to work their trap lines. For most, however, the fur trade could not provide full-time employment. Some Inuit found work with the various government agencies that moved into the North, while others had to live off casual employment and social assistance. With few jobs available, unemployment persisted as a major problem in every community in the decades ahead. In the 1950s and 1960s, the Canadian government became even more involved in the everyday lives of Inuit as it sought to expand its administrative activities in the North. In so doing, Ottawa jettisoned the old policy of “keeping the Native Native” and became far more paternalistic in its approach, often causing great damage to Inuit. In the 1950s, Ottawa forcibly relocated Inuit from Inukjuak in Northern Québec to Grise Fjord	and Resolute, ostensibly to provide them with better hunting grounds and greater prosperity, although many Inuit and historians argue that the government wanted to create a permanent human presence in the High Arctic to bolster Canada’s sovereignty over the region.During the construction of the DEW Line, the federal government started to post Northern Service Officers (NSO) to administer the new communities forming in Nunavut. In addition, the government initiated social welfare programs for housing, education, health care and economic development. In order to receive an education, however, many Inuit youth had to attend residential schools and federal hostels far from their communities, where they experienced emotional, physical and sexual abuse, as well as assimilatory practices that assaulted their language, culture and spiritual beliefs. Housing remained the first and most pressing problem for the expanding communities. Adequate housing could neither keep up with the number of new people migrating into the communities, nor could casually employed and unemployed Inuit afford houses. Overcrowding became a major problem. After reports of the deplorable living conditions arrived in Ottawa, a government-administered housing program was started to send prefabricated houses to the communities in the early 1960s. As communities developed, traditional methods of subsistence proved increasingly difficult, given the lengthy travel times to available resources and the need to engage in the wage economy. The Canadian government initiated its northern policies without consulting Inuit. 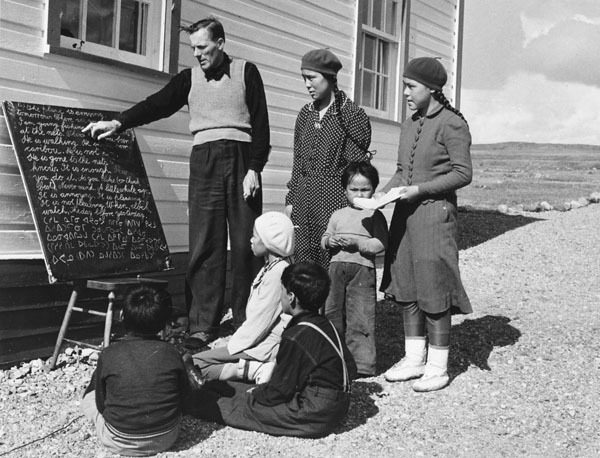 Ottawa’s paternalistic approach was highlighted during the 1952 meeting of the Canadian Eskimo Affairs Committee, when a senior government official said, “The only reason why Eskimos were not invited to the meeting was…that it was felt that few, if any, of them have yet reached the stage where they could take a responsible part in such discussion.” A territorial council in Ottawa administered the whole of the Northwest Territories, which then stretched over one third of Canada’s land mass. Slowly, however, Inuit became more politically active. Inuit became involved in local government and administrative organizations such as town and hamlet councils and housing authorities. In 1950, Inuit became eligible to vote in federal elections, and in 1966 the first Inuk, Simonie Michael, was elected to the NWT Council. Additional changes came in 1967 when the territorial government moved from Ottawa to Yellowknife, but even this was incredibly distant for Inuit living in the Eastern Arctic. In the late 1960s and early 1970s, Inuit across the Canadian Arctic started to organize to discuss land claims and better governance options. In 1971, the Inuit Tapirisat of Canada was formed and was heavily involved in the preparation of the first Inuit land claims proposal in 1976. This proposal called for a land claim and the creation of a new territory, administered by a new government. In this territory, Inuit would have political control through their sheer numbers and voting power. The proposal was soon withdrawn, however, because of its complexity, lack of community input and concern that it had been overly influenced by southern consultants. First the NWT Inuit Land Claims Commission (1977), then the Nunavut Land Claims Project (1979) and finally the Tunngavik Federation of Nunavut (1982) were formed to deal with the land claims negotiations. In these negotiations, Inuit consistently clashed with the federal government over whether the land claims should include the political division of the Northwest Territories, leading to the creation of a new territory. Only after years of debate was the idea of Nunavut accepted by the federal government, but it was still decided to negotiate the creation of the new territory separate from the land claim. Peter Ittinuar, first elected representative of the district of Nunatsiaq, at the Ontario Science Centre on 13 October 1978. The concept of a separate Nunavut steadily grew. In 1979, the Northwest Territories was divided into two federal electoral districts, with the new eastern district of Nunatsiaq corresponding to what would become Nunavut. 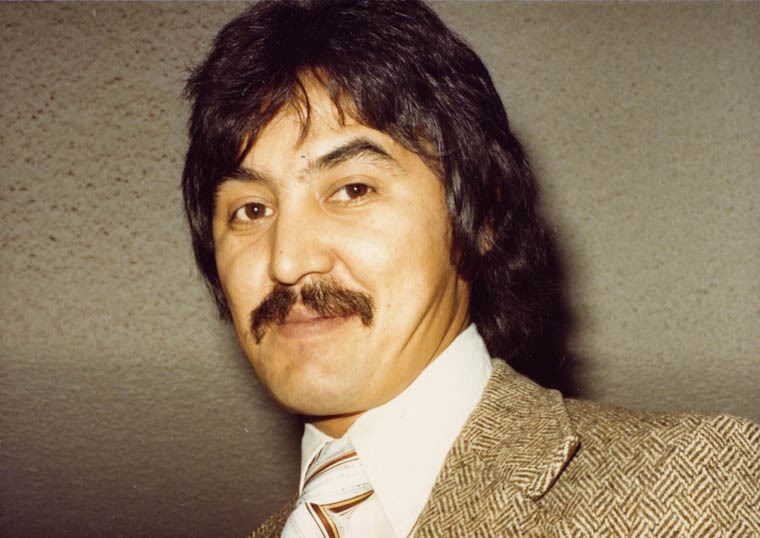 The first member elected in that district, Peter Ittinuar, was also the first Inuk to sit in the House of Commons.In 1982, the NWT Division Plebiscite ended with 56 per cent of the voters in favour of division. In the eastern Arctic, where the Inuit population was highest, the percentage in favour of division reached 80 per cent. Afterwards, the Nunavut Constitutional Forum was created to plan for the division. While there was much debate over the boundary line between Nunavut and the Northwest Territories, in 1992 the proposed boundary passed in another plebiscite. An agreement-in-principle on the land-claims settlement was finally reached in 1990. Members of both the Tunngavik Federation and federal negotiating teams signed this document, the “Nunavut Land Claims Agreement” (NLCA), in September of 1992. It was then put to a plebiscite in October of 1992 and saw a record turnout of voters, who passed the agreement with an overwhelming majority of 84.7 per cent. The Nunavut Land Claims Agreement Act — the largest Indigenous land-claims settlement in Canadian history — which ratified the agreement, and the Nunavut Act, which created the new territory, were both passed on 10 June 1993. The NLCA granted Inuit the right to hunt, fish and trap throughout the territory. That Agreement subdivided Nunavut into three designations of land: 1) Crown lands over which Inuit have the right to hunt, trap, fish and participate in management; 2) 318,084 km2 of Inuit-owned land, including rights to the ground’s surface but not what lies beneath; and 3) 37,883 km2 of Inuit-owned land including both surface and subsurface rights. Inuit were invited to select the parcels of land for each designation. In compensation for the Crown lands that were not to be Inuit property, the federal government agreed to pay recognized Inuit organizations $1.17 billion over 14 years. After ratification of the two acts in 1993, attention turned toward implementation. This process was led by Chief Commissioner John Amagoalik, while the land-claims settlement process was spearheaded by Nunavut Tunngavik Incorporated (NTI). Over the next few years, these groups created new government departments and trained employees. On 15 February 1999, the first election was held in Nunavut to vote in the first members of the legislative assembly. After the election, the assembly chose Paul Okalik	as the territory’s first premier, while the federal government appointed Helen Maksagak as the first Commissioner of Nunavut. On 1 April 1999, Nunavut officially separated from the Northwest Territories to become the newest Canadian territory. Until 2016, Nunavut was the least inhabited province or territory in Canada, a title it has since lost to Yukon. Currently, the territory has the strongest population growth in the country, reporting a 12.7 per cent increase between the 2011 and 2016 censuses (the population rose from 31,906 to 35,944). Most of this population increase is the result of Nunavut possessing the highest fertility rate in Canada — an average of 2.9 children per women, well past the national average of 1.5. This rapid growth has earned Nunavut another important distinction: it has the youngest population in Canada, with about 30 per cent of Nunavummiut being under the age of 14 in 2016. There are four official languages spoken in Nunavut — Inuktitut, Inuinnaqtun (a dialect of Inuktitut spoken in Kitikmeot), English and French. Inuktitut and Inuinnaqtun is the mother tongue of 65.1 per cent of Nunavummiut. While English is spoken throughout the territory, Iqaluit is also home to a large francophone community. Nunavut has the only act (the Inuit Language Protection Act) in Canada that aims to protect and revitalize an Indigenous peoples’ language and insists that the Government of Nunavut take positive action to advance the Inuit language in government, education and other public services. In 2001, the last year statistics are available, over 93 per cent of Nunavummiut identified as Christian. Nunavut’s population of 35,944 residents is spread out across 25 communities, ranging in size from a couple of hundred people to 7,740 in Iqaluit, the territory’s capital. Most of these communities are geographically isolated and accessible only by air and sea. These communities are split into three administrative regions: Qikiqtaaluk, Kivalliq and Kitikmeot. Qikiqtaaluk is the most populated and spans the northernmost, easternmost and southernmost areas of Nunavut. There are 13 communities in Qikiqtaaluk: Iqaluit, Cape Dorset, Hall Beach, Igloolik, Arctic Bay, Resolute, Pond Inlet, Grise Fiord, Clyde River, Pangnirtung, Sanikiluaq, Qikiqtarjuaq and Kimmirut. The Kivalliq region consists of all the territory on the mainland west of Hudson Bay , along with Southampton and Coats Islands. It is made up of seven communities: Rankin Inlet , Chesterfield Inlet, Baker Lake, Coral Harbour, Whale Cove, Naujaat (Repulse Bay) and Arviat. The Kitikmeot region consists of the southern and eastern parts of Victoria Island , King William Island and the southern part of Prince of Wales Island, and the adjacent part of the mainland as far as the Boothia Peninsula. Kitikmeot includes seven communities: Cambridge Bay , Kugluktuk, Taloyoak, Gjoa Haven, Kugaaruk, Umingmaktuuq and Bathurst Inlet (Umingmaktuuq and Bathurst Inlet are only occupied on an occasional basis). Although many of these communities have experienced gains in health, education and employment, their residents continue to experience challenges that severely reduce their standard of living. These challenges include the high price of food and other commodities, overcrowded housing and housing shortages, high construction costs, problems delivering essential services, a shortage of health-care providers in the smaller communities, inadequate Internet access and slow economic growth. Resource extraction has always formed the foundation of Nunavut’s wage economy. After the decline of the whaling industry at the end of the 19th century and the end of the fur trade	in the 1930s, little economic development occurred in Nunavut. In the decades that followed the Second World War, however, Nunavut experienced a wave of mineral and oil exploration. The Canadian government and private companies explored the natural resources of the region with little consultation with the Inuit who lived on the land. As communities expanded in the 1960s, the Canadian government assisted with the development of cooperative businesses (an example is the cooperative fishery established in Cambridge Bay) to help provide employment opportunities to Inuit. Since the 1960s, Nunavut’s economy has expanded to include commercial inshore and offshore fisheries, renewable resource harvesting, arts and crafts, tourism and an expanding service sector. In general, Inuit welcome development, so long as it respects the land and provides Nunavummiut with economic opportunities. Nunavut is serviced by several developmental agencies that pursue economic opportunities on behalf of Nunavummiut. At the territorial level, the Nunavut Development Corporation is a public agency with the mandate of creating employment opportunities and promoting economic diversity and stability for all Nunavummiut. TheAtuqtuarvik Corporation, the NCC Investment Group and Nunasi Corporation are Inuit-owned investment corporations created to represent the economic interests of all beneficiaries of the Nunavut Land Claims Agreement. Three regional development corporations, the Qikiqtaaluk Corporation, the Sakku Investments Corporation and the Kitikmeot Corporation, also promote development in their respective regions. The postwar expansion of the global economy fuelled by an abundance of cheap oil had a dramatic impact on Nunavut. Oil exploration began throughout parts of the Arctic Archipelago	in the 1950s and 1960s, and test wells were drilled on several islands, including Cornwallis, Bathurst, King Christian and Melville Islands. Exploration increased with the oil crisis of the 1970s. Cameron Island represents the only site that has been developed for commercial oil production in Nunavut. From 1985 to 1996, Suncor used the tanker MV Arctic to ship light crude from Bent Horn in the southwest of the island to Montréal. The field produced 2.8 million barrels of oil before it was abandoned by Suncor. Oil and gas exploration has continued in Nunavut. In 2016, a case was brought to the Supreme Court by the community members of Clyde River over the National Energy Board’s	decision to allow companies to conduct seismic tests across Baffin Bay and Davis Strait in search of offshore oil and gas, which many believe will harm marine life. In December 2016, the federal government issued a ban on all oil and gas drilling in Arctic waters, although this ban will be reviewed every five years. Nunavut is the only province or territory in Canada that relies exclusively on imported fossil fuels for its energy needs. All electricity in Nunavut is supplied by Qulliq Energy Corporation (QEC), a territorial corporation owned by the Government of Nunavut, through diesel combustion in 26 stand-alone diesel plants in 25 communities (Iqaluit has two). Nunavut is completely dependent on millions of litres of imported petroleum products to support everyday living. Mineral development in Nunavut has always proven difficult because of the extreme operating conditions and lack of infrastructure. Still, several lucrative mines have been opened in the territory over the last few decades. Past mining operations in Nunavut include: the Lupin Mine near Contwoyto Lake (gold); Polaris Mine on Little Cornwallis Island (lead and zinc); Nanisivik Mine on Baffin Island (lead and zinc); Rankin Nickel Mine (nickel, copper and platinum); and the Jericho Diamond Mine, 420 km northeast of Yellowknife. There are currently two major mines in full operation in Nunavut. Agnico-Eagle’s Meadowbank mine is an open-pit gold mine in the Kivalliq region, while the Mary River Iron Ore mine, operated by Baffinland Iron Mines, produces such high-quality ore that no processing is required before it is shipped to market. Baffinland shipped its first iron ore to European markets in July 2015. In addition, TMAC Resources has also started to mine gold at its Doris North Gold Mine in Hope Bay, although the site is not yet fully operational. Meanwhile, exploration continues across Nunavut, particularly in Kitikmeot’s greenstone belt, a large geological area that has a high number of deposits. Mines often raise environmental concerns, such as loss of habitat for caribou	and other animals. They also have the potential to provide hundreds of jobs to Inuit, as well as resource royalties to the territorial government. Traditional harvesting continues to play an important role in Nunavut’s economy. Harvesting animals provides country food to supplement diets, but also fur, skin and bones for clothing, games and art. Nunavut has established commercial char, shrimp and turbot fisheries. In particular, the turbot fishery is a major employer in the Baffin region. As more studies are completed on its commercial fishing stock, Nunavut anticipates the fisheries sector to be an important area of growth in its economy. Tourism in Nunavut tends to focus on outdoor activities and the territory’s natural beauty, as well as Inuit culture. The range of tourism activities includes ecotourism (especially wildlife watching), exploration of Nunavut’s territorial and national parks, sport hunting, fishing, cultural, adventure and educational activities. The number of cruise ships visiting Nunavut’s waters has increased in recent years, largely due to reduced ice cover and a longer shipping season. The production of Inuit art plays an important role in Nunavut’s economy. Across Nunavut’s communities, the arts sector creates almost 1,100 full-time jobs and additional opportunities for some 2,000 Nunavummiut who sell their crafts door-to-door. While Nunavut is known for its carvings of stone, bone and ivory, and the print-making that occurs in many communities, the territory’s artists also produce weavings, clothing, jewellery, metal works and large-scale drawings. Moreover, further diversification happens every year in the industry. For example, in Kugluktuk, residents produce high-end qiviut wool from the hides of muskox for export. In 2016, the annual unemployment rate for Nunavut was 14.9 per cent, the highest in the country. The largest employer in the territory is the Government of Nunavut, although new jobs are emerging in construction, mining, mineral exploration, the fisheries sector and tourism. The Legislative Assembly of Nunavut, in Iqaluit. Nunavut has a consensus government system, which blends the principles of parliamentary democracy with Inuit values of cooperation, egalitarianism and communal decision-making — different from the system of party politics that exists everywhere else in Canada, with the exception of the Northwest Territories. Within this system, however, unanimous agreement is not necessary for decisions to be made in the Assembly, although unanimity is often achieved. While ministers are expected to vote with Cabinet, regular MLAs may vote based on their individual opinions. One of Nunavut’s central goals has always been the decentralization of governance beyond the territorial capital, Iqaluit. While the Kitikmeot, Kivalliq and Qikiqtaaluk regions do not have autonomous governments, they do have Regional Inuit Associations, the Qikiqtani Inuit Association, Kivalliq Inuit Association and Kitikmeot Inuit Association that provide a basis for local administration. These associations manage Inuit-owned lands for the Inuit beneficiaries of the regions, work for the protection, administration and advancement of Inuit rights and benefits, and promote the economic, social, political and cultural well-being of their regions. 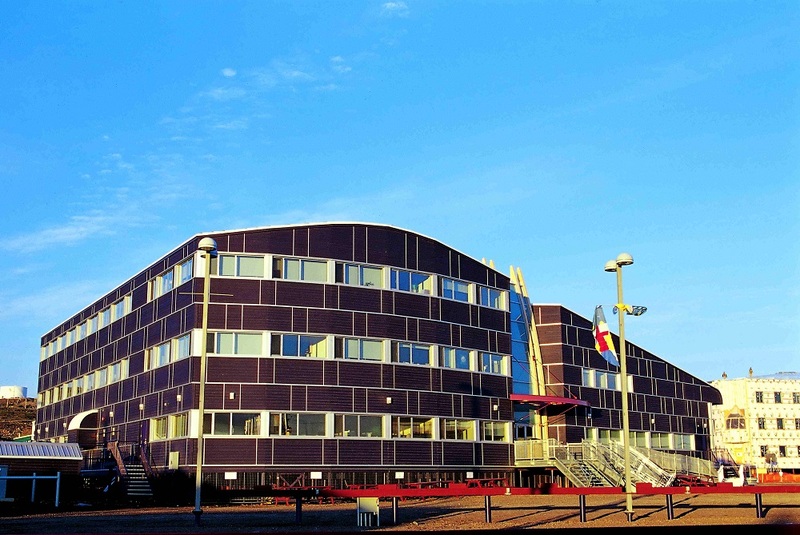 Nunavut is unique in Canada in that it has a unified, or “single level” court, the Nunavut Court of Justice. In sharp contrast to other provinces and territories that have separate lower provincial courts and superior courts, Nunavut’s federally appointed judges hear all matters assigned to both the lower provincial courts and the superior courts. Besides holding court proceedings in Iqaluit, the judges all travel as a circuit court throughout Nunavut’s communities. The court travels to the communities based on need, visiting some every six weeks and others less than once every two years. Members of the circuit court include a judge, clerk of the court, court reporter, prosecutor and at least one defence attorney. While on circuit, court is held in community halls, school gyms and other available space, and elders often sit with the judges in the courtroom. Currently, Nunavut has one hospital, the Qikiqtani General Hospital in Iqaluit, and two larger health centres in the regional centres of Rankin Inlet and Cambridge Bay, which are also staffed by physicians. Health services in the remaining communities are provided by community health nurses, while physicians visit them throughout the year. These centres are administered by the Department of Health of the Government of Nunavut. To receive specialized or advanced care, Nunavummiut often must travel to tertiary care facilities in places like Yellowknife, Edmonton, Winnipeg or Ottawa. The Government of Nunavut also provides many public health services and health promotion initiatives, including maternal-child health supports, immunization clinics, chronic disease management, sexual health, anti-tobacco-use programs, oral health, nutrition and food security initiatives. Throughout Nunavut, traditional medicines and healing continue to play a vital role in the health of Nunavummiut. Nunavummiut face many health challenges, often caused by overcrowded, poorly ventilated homes and poor access to medical care. Over 60 per cent of Nunavummiut smoke, leading to high rates of lung cancer and respiratory diseases. Nunavut has high rates of diabetes, obesity, sexually transmitted infections, suicide, tuberculosis and the highest rate of infant mortality in the country. Due to the high cost of food in Nunavut’s communities, food security remains a pressing health issue, with two-thirds of Inuit preschoolers living in food-insecure homes. Starting in the 1970s, Inuit have taken ever greater control of education in Nunavut. In the 1980s, the Eastern Arctic operated under the mandate of three Inuit school boards, responsible for staffing, policies and programs. With the creation of Nunavut, the territory’s Department of Education dissolved the boards, replacing them with regional offices, although it still used legislation inherited from the Northwest Territories. In 2008, Nunavut passed its own education act, which called for bilingual education for all students by 2020 (an Inuit language and either English or French), incorporation of Inuit culture into all aspects of the education system (including consultation with communities and elders) and additional support for students to stay engaged in the educational process. Progress toward the goals set in the Nunavut Education Act has been slow, and the Department of Education has been subject to a great deal of criticism over the effectiveness of the education system, leading to calls for greater Inuit influence, better accommodation of the special needs of students and more local control. In 2015, Nunavut had the lowest percentage of high-school graduates within its working-age population in Canada, despite spending, proportionately, the most amount of money on education. Just over half, or 54 per cent, of the territory’s population between 25 and 64 have finished high school. Building on the adult education initiatives started in many northern communities in the 1960s and 1970s, Arctic College was established in 1984, with campuses in Fort Smith and Iqaluit. In 1986, the Arctic Colleges Act gave the college the mandate to deliver adult and postsecondary education across the Northwest Territories. In 1995, Nunavut Arctic College was created in anticipation of the division of the Northwest Territories. Today, it is the only postsecondary institution in the territory, with a range of degree, diploma and certificate programs in language and culture, business, fine arts, environmental technology, human services, apprenticeship trades and adult basic education programs. The college’s two degree programs, teacher education and nursing, are delivered in partnership with the University of Regina and Dalhousie University respectively. The college has five campuses: Nunatta Campus in Clyde River, the Nunavut Research Institute Science Campus in Iqaluit, Kivalliq Campus and the Nunavut Trades Training Centre in Rankin Inlet and the Kitikmeot Campus, located in Cambridge Bay. Community Learning Centres staffed by adult educators are located in all 25 communities. Much of the transportation infrastructure in Nunavut was constructed in the 1970s, although parts of the system were built in the 1940s and 1950s. There are no roads connecting Nunavut to the rest of Canada, nor are the territory’s communities connected by roads. Roads exist in and around communities, although these are not extensive. In Nunavut, the Community Transportation Initiatives Program is slowly expanding road access to important harvesting, recreational and cultural sites. Many of the necessities of life in Nunavut arrive by air or ship. In Nunavut, the airport system is centred on regional hubs, Iqaluit, Rankin Inlet	and Cambridge Bay, which can accommodate jet aircraft and provide access to other communities. Smaller aircraft then move people and goods, including mail, fresh food and other supplies, from the hubs to the other communities. During the short summer months, large ships and barges bring building materials, vehicles, fuel and non-perishable goods to Nunavut’s communities. In recent years, an increase in Arctic cruise ship tourism has led to heightened levels of maritime traffic. Since Nunavut’s creation, discussions on how to improve the territory’s transportation system have focused on the construction of community small-craft harbours, deep-water ports and surface or road links to Canada, especially between Kivalliq and Manitoba, and from Yellowknife to the potential mine sites around Bathurst Inlet. Although Inuit life changed significantly over the course of the 20th century, traditional values and cultural practices remain strong amongst Nunavummiut. Inuit Qaujimajatuqangit, or traditional knowledge, which includes storytelling, mythology, music and dancing, remains an essential part of cultural life in Nunavut. Inuit continue to embrace the land and sea as integral to their cultural identity and community health. As such, going out on the land, harvesting its resources and sharing this bounty with family and community also remain important elements of Nunavummiut cultural life. Inuit cultural institutes and heritage societies have been established in most of Nunavut’s communities, and they are very active in recording the knowledge of elders, preserving Inuit languages, teaching traditional skills and culture, and promoting Inuit societal values. Many communities also have museums or cultural displays that explain their histories and the culture of their people. Art is thriving in many of Nunavut’s communities, and has a long history in the region. Prominent graphic artists from Nunavut include Luke Anguhadluq (1895-1982), Jessie Oonark	(1906-85), Pudlo Pudlat (1916-92), Andrew Qappik (1964-)and Annie Pootoogook (1969-2016), while prominent printmakers include Pitseolak Ashoona (1916-92), Kenojuak Ashevak (1927-2013) and Kananginak Pootoogook (1935-2010). Carvers Simeonie Amagoalik (1933-2011) and Looty Pijamini (1953-) are known for their sculptures commemorating Inuit who were forced to relocate to the High Arctic by the federal government. Beyond more traditional arts and crafts such as carving and print-making, Nunavut artists are also making a dramatic impact in music, film and broadcasting. The international success of films such as The Necessities of Life	(directed by Benoît Pilon and starring Inuk actor Natar Ungalaaq) and Atanarjuat: The Fast Runner (directed by Zacharias Kunuk and starring Inuit actors Ungalaaq, Sylvia Ivalu and Peter-Henry Arnatsiaq) has brought attention to the budding film industry in Nunavut. Meanwhile, Inuit throat-singing, drumming and other Indigenous music continue to enthrall international audiences. Susan Aglukark	grew up in Arviat, Nunavut and is a three-time Juno award winner for her blend of country and pop music. In 2014, genre-bending throat-singer Tanya Tagaq	won the Polaris Music Prize for her album Animism. While Nunavummiut play many Western recreational games such as soccer, hockey, baseball and basketball, they also embrace traditional Inuit games such as the one and two-foot high kick, kneel jump and arm pull. The Arctic Winter Games, held biannually since 1970, include a variety of traditional and nontraditional games and involve athletes from across the Circumpolar World. Jack Hicks and Graham White, Made in Nunavut: An Experiment in Decentralized Government (2015). Melanie Gagnon and Iqaluit Elders, Inuit Recollections on the Military Presence in Iqaluit (2002). Robert McGhee, Ancient People of the Arctic (2001). Pan Inuit TrailsExplore the vast network of traditional Inuit trails, as mapped in this atlas. Aboriginal Arts and StoriesThe website for the Aboriginal Arts and Stories contest, which features Canada's largest essay writing competition for Indigenous youth (ages 14-29) and a companion program for those who prefer to work through painting, drawing and photography. From Historica Canada.